The combination of ozone and UV-C (AOP) integrated in this smart designed purifier, ensures fresh and healthy pool water with the possibility of using a minimum of chlorine. This revolutionary combination of ozone and UV-C (AOP) makes a pool with a minimal amount of chlorine possible! With this Blue Lagoon AOP Compact Ozone & UV-C unit on your pool system you´re able to keep your pool water fresh, crystal clear and especially hygienic clean. This device is able to reduce the chlorine concentration up to 50-80%! You connect the Blue Lagoon AOP Compact Ozone & UV-C on to your swimming pool system. Using a pump, the water is pumped into the unit through the supplied reactor. Because of the water pressure in the reactor, air is sucked through the Venturi system. Air is sucked into the unit via the air valve and flows through the area between the quartz glass and the AOP Compact Ozone & UV-C lamp. The lamp has a double function, producing ozone and UV-C light at the same time. Because air enters the unit via the lamp, ozone is generated by the special AOP Compact Ozone & UV-C lamp, which produces 0.6 grams of ozone. After it has passed the ball valve, the ozone enriched air is then mixed with water in the system. The oxidation and sterilisation take place here, and a powerful disinfection process is achieved. The water-ozone mixture is then exposed to the UV-C radiation of the lamp. The UV-C breaks down the remaining ozone in the water, changing it into OH- (Hydroxyl radicals) which have a very high oxidation potential. Connections: Ø63mm/ 50mm / 1 ½”. Please notice the correct grounding! 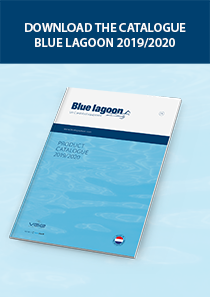 Where to buy Blue Lagoon products? We have a global dealernetwork where Blue Lagoon UV-C purifiers and pool supplies can be bought. Can’t find one near you? Please contact us. Download manual AOP Compact Ozone & UV-C (pdf, 3,6 mb). Chlorine for pool sanitation down the drain in 2020? If UV-C for pools is so great, why not stop using chlorine altogether? What determines the effectiveness of a UV system to treat pool water? 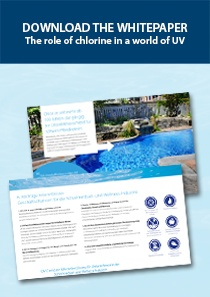 What are factors that influence the choice of a UV system to disinfect pool water?